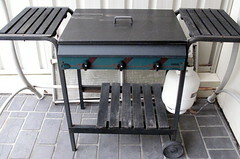 I am Australian and my give-away for today is a barbecue. If you are from another country you may wonder what is unusual about being Australian and giving away a BBQ, so I will explain. Just about every household in Australia has a BBQ, because of our climate we are a very outdoorsy kind of people. When friends come around for a meal the normal procedure is to “chuck a steak on the barby”. Personally though I would rather cook a nice roast dinner, a spicy curry or maybe make gourmet pizza and as a result our BBQ has not been used for the last three years since we took it our of storage after an extended period of living overseas. The moral of this story is, just because everyone else seems to have one doesn’t mean you have to. There are people out there who don’t have cell phones, computers, bicycles, cars or even televisions and they survive very well. So no matter what it is, if you aren’t using it now, you probably never will so pass it on to someone who might get some use out of it. So today I am going to wheel my BBQ out to the street (I live a a fairly busy road) and I am sure it will probably be gone within an hour. I will update this post to let you know how long it took to disappear. I put the BBQ out at 9:00am and it rained for about an hour. I went out at about 10:00am to see if it was still there, a car was parted nearby and a man was looking at the BBQ. I went out again at 11:30 and it was gone. 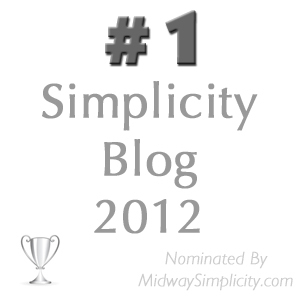 What a fab blog! I’m following from now on. Thanks for the nice compliment. I am glad I am not just talking to myself everyday.I look forward to hearing from you again. Hi, I came over from unclutterer to read your blog. I like it so far. I wanted to second your statement of not needing something just because everyone else has one. I donated my television 2 weeks ago. I haven’t used it for over a year. Anything I must watch I can see on my computer. So here here to not keeping stuff just because others do. Hi Amanda, thanks for dropping in. I think I could probably live without the television too since I rarely have control of the remote. How many re-runs of the Simpsons can one woman bare. All those channels and nothing worth watching most of the time anyway. Hi Colleen – not sure if you will get this as I’m replying to an old blog but will try anyway! I loved reading about your BBQ – we got rid of ours too, years ago – gave it to my step-son who is always outside with his family and it was an upgrade for him and he was happy. In theory we ought to have used it a lot – in reality we never did and if ever we did it always seemed very messy to clean up . And I love your story of putting it out the front – it makes me laugh to see how quickly things go – and we are in a “no through road” although admittedly on a walking trail with a creek across the road so I guess people must walk past and go back for their cars. Once(when we thought we were selling the house ) we carried a heavy park bench out to the front , went back to get some pots and the bench was gone- in less than 5 minutes ! I was gob smacked ! We discovered later it was our lovely neighbours who snapped it up, fixed it up , painted it and enjoyed it but laughingly offered to give it back when we told them we were staying and not selling . I think its great fun to see things disappear! I see every comment that comes through regardless of how old the post is. Yes the BBQ did leave a long time ago. It was a rainy day that day too but I still couldn’t help but duck up the driveway in the rain every 10 minutes or so to see if it had disappeared yet. Needless to say I didn’t get very wet as it went quickly. It was a perfectly good BBQ but as I said we didn’t use it much. If it had been on with a hood that I could roast in I probably would have kept it but alas it was a cheapie. We have never bothered to replace it with one with a hood either. Funny story about your bench. The neighbours were nice to offer it back to you.